Corsair’s debut pre-built PC offers reassuringly solid performance from a very small machine. The Corsair One is powerful, quiet, and comes free of the bloatware that infests other pre-built systems. The only problem is its steep price. You’re paying a premium to not have to get your hands dirty, which also makes it unsurprising that Corsair doesn’t want you upgrading the machine yourself. If you’ve spent any amount of time around gaming PCs then you’re probably familiar with Corsair, but its newest product, the Corsair One Webstore Edition, is a little different from what’s come before. The hardware specialist, which started out producing RAM modules for PC builders, has since branched out to provide almost every component you'll find in a typical PC build, from power supplies to cases, and from all-in-one watercoolers to peripherals such as mice and keyboards. In short, if you’ve ever built yourself a custom PC then you’ve probably at least considered using a Corsair component at one point or another. The Corsair One is different. Rather than requiring its users to assemble a system themselves, the pre-built desktop instead provides almost everything you need to get set up and running straight away, and it does so in a case that’s surprisingly small considering the beastly components contained within. But before we tackle the benchmarking of this machine, let’s look at what you get for your money with the Corsair One Webstore Edition. There are three Corsair One models available. The basic model comes equipped with an i7-7700 and an air-cooled Nvidia GTX 1070 and retails for $1,799 (£1,799 / AU$2,639). Next up is the Corsair One Pro, which ditches the GTX 1070 in favor of a water-cooled Nvidia GTX 1080 and costs $2,199 (£2,199 / AU$3,159). Finally, if you want to go all-out there’s the Corsair One Webstore exclusive, which upgrades the other two machine’s dual-drive configuration to a single 960GB SSD, is available only in the US, and costs a whopping $2,299. This US-exclusive version is the model we're reviewing. It’s pretty much as expensive as pre-built desktops come, and its internal CPU and GPU should be more than enough to chew through even the most demanding VR titles. The CPU/GPU configuration of the Webstore Edition we’ve got for testing is identical to the Pro model, so our benchmarks should be broadly the same for both models. So yes, it’s expensive, and you could build a similarly specced PC yourself for much less, but the Corsair One offers a couple of key advantages over the DIY approach. First is the form factor. With a total volume of 12 litres, and a size of 200 x 176 x 380mm, the Corsair One is a surprisingly small machine. It may be tall, but it’s got very little in the way of depth and width, although whether this size and shape makes sense to you will depend on the amount of space you have to play with. Given its small size it seems a shame it isn’t formatted more like a set-top box or games console, which would have allowed it to sit more neatly in a TV cabinet. This case doesn’t make the same upgrade compromises we’ve come to expect from other compact builds. Almost every component in the Corsair One can be swapped out and upgraded – but there’s a pretty big catch if you wish to do so. That catch is that doing so yourself will void your warranty. Instead, Corsair will offer a service whereby you’ll be able to send your machine into a repair centre, where it will be upgraded for you. This could be seen as a drawback – but then again, if you’re willing to spend this much money on a pre-built PC then you’re probably not someone who wants to get their hands dirty with upgrades either. The Corsair One is a machine for people who want something that works out of the box, and which they can ship to a professional for repair or upgrade. Fans of DIY tinkering should look elsewhere. Back to the form factor, and the second advantage the case has is a front-mounted HDMI port. Corsair has included this in a bid to make the machine perfect for use with VR headsets, and it means you can easily plug one of these in without having to reach around the back of your machine. Unfortunately, in its eagerness to put an HDMI port in the front of the machine, Corsair has neglected to include a headphone or microphone jack, which is an annoying omission. We could also have done with an extra USB port in an easily accessible location, for additional controllers and so forth. So, while we love the build quality of the Corsair One’s case, these issues mean it’s far from being perfect. Depending on your needs these might not be deal-breakers, but we’ve certainly seen more versatile machines out there, including cases from Corsair itself. Looks-wise the Corsair One has a refreshingly understated design. Its matt black finish means the machine won’t stand out too much when placed alongside other pieces of electronics, and although Corsair has included a couple of neon blue lights on the case’s front (how could it not? ), these are fairly subtle, and can be turned off if you’re not a fan of having your machine light up like a minimalist Christmas tree. The left and right sides of the machine are perforated to allow air to be drawn in through the water-cooling radiators, and this air is then expelled out of the top of the machine through a chunky grille. 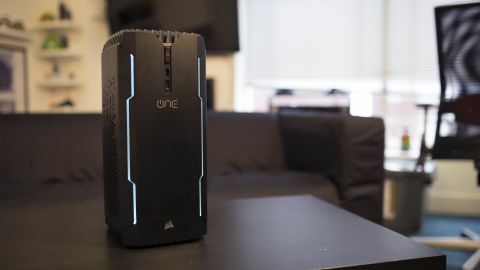 The aim here is quiet performance, and while the Corsair One seems to be louder than a full desktop tower build at idle, it’s much better than comparable small form-factor machines. Round the back you’ve got a fairly standard series of ports. There are a total of five USB Type-A ports, plus a single Type-C port for all you early adopters out there, in addition to audio ports, optical, Ethernet, two Wi-Fi antennas, an HDMI port, two DisplayPort plugs, a PS2 port and a three-pin power jack. On the back you’ve also got a neat little button to get inside the case, which is fantastically designed. It’s a subtle piece of industrial engineering that's testament to Corsair’s long history of designing premium cases. Of course, the real test of the Corsair One is how it performs, but before we get into that we have to applaud Corsair for the lack of bloatware shipped on this machine. It’s become depressingly common these days to have to do a clean install of Windows on a pre-built system, to get rid of the various unnecessary software that comes bundled with it. By contrast, the Corsair One’s desktop is refreshingly sparse. There’s a PDF containing some help documentation, a system monitoring and LED control utility, an SSD monitoring utility and a link to a series of installers for the biggest pieces of gaming software (think Steam, Origin, Battle.net and the like). Only one piece of software could be considered bloatware, and that’s a piece of software for controlling the RGB lighting on Corsair peripherals. In contrast, systems from other vendors pack in anti-virus trials, browser toolbars and back-up utilities. While the Corsair One’s speed is undoubtedly due to its beefy hardware, it’s nice to see it come unencumbered by superfluous software in this way. Getting into the benchmarks, the Corsair One performed admirably. Water-cooling may not be cheap, but it pays off in a machine like this, which is able to extract every bit of power from its components without having to worry about them overheating and throttling performance. Since it’s packing a GTX 1080 rather than the recently released GTX 1080 Ti the system isn’t quite able to handle games at 4K without compromise, but it can get pretty damn close, and it's more than a match for the current VR headsets on the market. Its 16GB of RAM leaves plenty of headroom for most gaming use cases, and at full load the amount of sound coming from the machine’s fans was only slightly higher than idle. We did experience a small amount of high-pitched electrical buzzing during some of our testing. This was most apparent during stress tests involving high frame rates that you’re unlikely to reach during normal gaming, bit it was also apparent during our GTA V ultra graphics test. It's a shame that it occasionally spoiled what was otherwise a very quiet desktop experience. The bottom line is that this is a powerful machine indeed, although for the price that’s not too surprising. The only downside is that the Corsair One was designed before the GTX 1080 Ti was available, meaning it misses out on offering ‘true’ 4K gaming. If you’re after a premium pre-built desktop PC, then there aren’t many out there that feel as premium as the Corsair One. It’s solidly built, neatly proportioned, and runs surprisingly quietly considering the amount of horsepower it’s packing. We also love the precedent Corsair has set by shipping the machine without any superfluous software, meaning you can get it set up in no time at all. But it’s clear that this is a machine that’s been designed with a specific kind of user in mind. DIY tinkerers best look elsewhere, because this is something that’s not designed for you to upgrade at home. The prospect of being able to have the machine upgraded further on down the line is welcome, and should help with future-proofing, but Corsair has made a deliberate decision to keep this process out of the user’s own hands. If you want a machine that you can buy and use without the prospect of upgrading it yourself then the Corsair One is a fantastic piece of kit, but if you’re a PC gaming enthusiast who likes to get things done yourself then there are cheaper, more easily upgradeable, alternatives out there.